We provide you with masterful remodeling and renovation services, no matter what kind of damage your home has sustained. King's Remodeling & Restoration, Inc. is available to help you restore your property after accidents or emergencies caused by storm, mold, fire, and water. King’s Remodeling & Restoration works with insurance companies to provide you with the most accurate estimate, ensuring you get what you are entitled to within your insurance policy. We are a Class A General Contractor and we provide masterful remodeling for your home. We also provide restoration services in the event your home suffers damage due to fire, storm, water or mold. As a locally owned and operated business, we strive to bring you the best service in the area with the honesty, caring and integrity you deserve. We contacted Kings based on a recommendation and have now used them on four projects in our Lake Anna home. The workmanship is excellent and their employees are courteous and professional. We like that they take the time to explain options and costs related to each option. Their pricing is fair and they honor their commitments to their customers. GREAT company, GREAT people! So I'm hearing about how brutal they expect this winter to be& I'm flashing back to this past January when we had an oil furnace blowback that created a HUGE mess on the entire bottom floor. So I'm giving my personal recommendation from that experience--I'm very thankful that Kings Remodeling & Restoration came to our rescue, within less than 24 hours, to start the cleanup & restoration process. 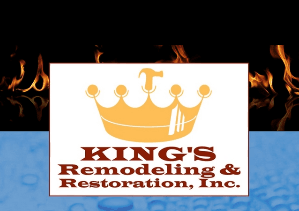 I have been very pleased with the responsiveness and work King's Remodeling and Restoration has been doing on my home as a result of the water intrusion. I highly recommend them! Please accept my sincere appreciation for the work just completed by the flooring team. Absolutely first rate quality and services. Everyone paid extra attention to details. I was amazed at how easily they accepted the working conditions. A small space to work in and having to shuffle stacks of boxes, and then be a moving company several times over as my furniture was relocated, and relocated, and relocated. And not one speck of damage. Everyone got along, there was a cooperative attitude, my house and property was protected and clean at the end of everyday. More than that, they were all nice, clean, and more than polite people. I want to provide feedback regarding King's Remodeling and Restoration. In an industry that sometimes lends itself to empty promises, we were continuously overwhelmed by the service King's provided.Everyone in the company was courteous and hard-working. The level of professionalism is unmatched and the workmanship is second to none. Since King's is based out of Fredericksburg, one of our concerns at the beginning was reliability. They had more than an hour commute to our house everyday. This was absolutely a non-issue, and was taken care of seamlessly. We never felt as though our job was secondary to another because they weren't based in Richmond. The crew worked full days at our house consistently until the fire damage was taken care of. We couldn't be happier, and the house is beautiful - we have gotten so many compliments from neighbors just walking by. We would recommend King's Remodeling and Restoration, without reservation, to anyone in need of this type of work.